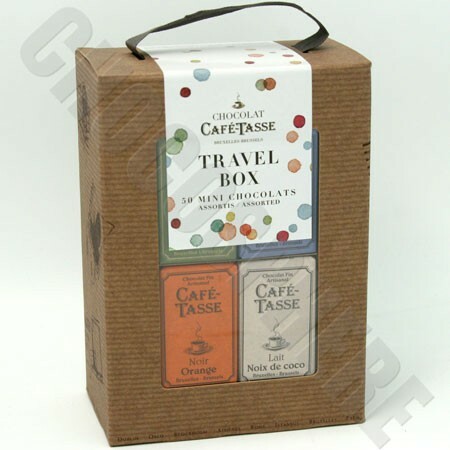 Cafe-Tasse Belgian 50 Assorted Mini-Bars individually wrapped in an attractive box with carry handle, total net wt. 450g/15.8oz. The perfect box of Belgian chocolate to take on that journey when you need the "pick-me-up" that comes from Café-Tasse Minis! Or, carry a box as a gift to someone special. Contains 50 9g/.32 oz mini bars in an assortment of many of your favorite flavors.